When I was a young girl growing up outside of Vicksburg, Mississippi, my mother and I used to spend evenings after supper dishes were done, with our needlework and watching television. Growing up in Mississippi in the 50’s and 60’s was a simple, poor and life changing time. Simple because of the way we lived yet we were in the very heart of desegregation and many changes in the south. What I remember the most was the simple. As I get older, I have found that I am gravitating back to the simple life. No fancy parties, quiet times on the couch reading, canning, cooking and yes, needlework. Learning to crochet when I was only 8 or 9 came from my wonderful next-door neighbor, Mrs. Eva and then her sister-in-law taught me to knit. I wish I could remember her name, but I can see her face as clearly as if she were sitting next to me. For a quiet rather poor kid in rural Mississippi the evenings were spent, when possible, sitting with those two ladies and listening to them talk. I learned a lot about how older people think just by spending time with them. I learned a lot about how women think in general. They were oh so special and I am sure my mother was happy to have me out of her hair for a time. I croched many afghans during the 70’s. Over time those needles disappeared, never to be thought of again. After a 30-year absence of knitting, about 10 years ago, I picked up a set of needles and 3 skeins of yarn. I started slowly and believe it or not, I remembered how to knit. I knitted three warm scarves that winter while watching Law and Order. I had gotten rid of my needles back in my 20’s thinking that I would never return to knitting, just like crocheting. The embroidery though was my mother. I remember sitting many evenings embroidering the state birds and flowers of each state onto squares. Many evening were spent with Ed Sullivan, Heehaw, I love Lucy and other programs of the day with the entire family watching. We were quiet, peacefully embroidering away. 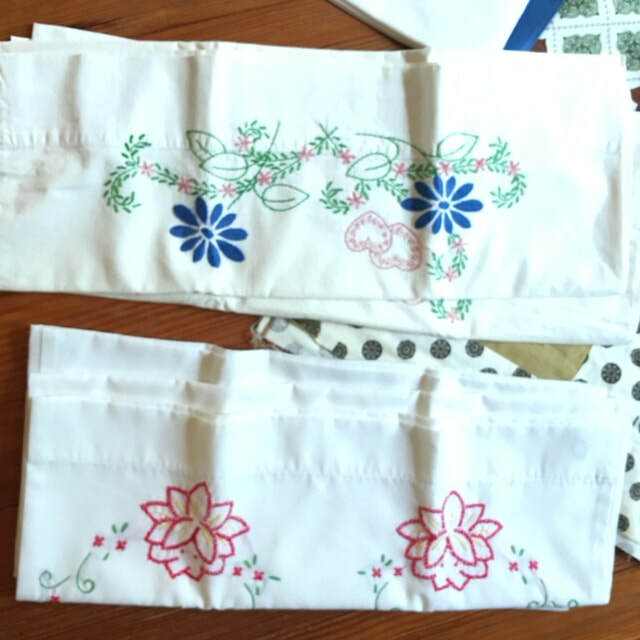 Just a few years ago at a quilting trade show with Accomplish Quilting, I picked up some embroidery thread and a pattern and started working on a tea towel. My mother was a fabulous embroiderer. I inherited some of her special pillow cases and use them today. My dear mother (Wilda Hisaw) passed away almost 12 years ago at the young age of 66. Her last year was rough and if it had not been for my sister moving her into her home in Mississippi, I have no idea how we would have gotten through that time. Because my sister and her husband took such great care of Mom, when she passed away, it was my sister’s job to sort mom’s possessions and dispose or give away everything. My sister asked me if there was anything that I wanted. My only request was that she take whatever she wanted and that all I was interested in was photographs. We agreed that when we got together, we could go through them. So, my sister packed up what she thought should be kept and gave away the rest. Today she is still the family historian who collects and keeps all of our memories. I was unaware that when she was sorting and selecting things, that she had not opened every storage tub. There happened to be several tubs that just got packed up and put away at my sister’s house for a later date to sort through. She proceeded to tell me about the tubs that she had not opened. She called to tell me that she had opened one of the tubs and could not believe what she found! Inside were 9 quilt tops neatly folded and placed in this time capsule of a plastic blue tote. What quilts I thought? I was mystified until she started describing to me what they looked like. I had not thought about Mamaw and Mom quilting in years! I asked her to please take a snapshot with her phone and text them to me. To our amazement, my sister and I are in possession of 9 quilt tops! The other amazing thing is that I work for Accomplish Quilting. While I never knew it as a child, I was participating in quilting in a small way. Mom and Mamaw both quilted but in later years, much of their work was set aside and forgotten about. As we all know, AND I NOW KNOW, this business is an amazing business with many men working in quilting. “These aren’t your granny’s quilts today!” I tell people who are amazed as I am about the quilting industry. The whole industry changed, and quilting has gone on to another level quite different than pajama material of my grandmother's. I sit with tears in my eyes as I write this. It is truly odd how life or some may say that God works. I don’t know how to quilt but I work for a quilting company. So, this winter, next month to be exact, I will be taking our LicenseTo Longarm class in the Indiana store so that I can finish my mother and grandmother's quilts. I will be closing the circle of love on the 9 quilt tops that had so much time, love and work put into them. Each of them once finished, will be dispersed to my two brothers, one to my sister, the state birds to me and others to my nieces and nephews. And of course, Uncle Sony will finally get the quilt his mother stitched for him. Life is amazing. It was like my mother and grandmother saying hello from beyond. They left something beautiful and dear behind and you can rest assured that those two dear ladies will never be forgotten. Thanks Mom and Mamaw. You left us a wonderful gift. And I will now be a quilter also. The circle is closed. I remember watching Mom do these. 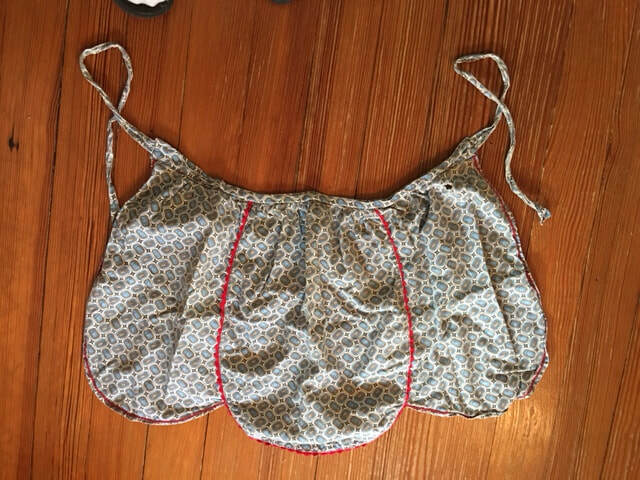 Mamaw's cooking and canning apron. I actually remember these on my parent's bed. I am looking for others to do phone interviews or submissions from others with Quilt Stories. How did you come to quilt? Do you know of someone who has a story to tell? Is there an amazing story out there of how quilting was passed on to you? That we have Stories Behind the Quilts on our website. Enjoy great stories of some amazing quilters. Click HERE to read more stories.